It’s hard to believe today, but the historic center of Stockholm, Gamla Stan, was once slated to be razed, and it was only saved due to the high cost of demolition. At the time, in the mid 1800’s, demolishing Gamla Stan was a given—plans to flatten the “unsanitary slum” were praised as being modern and forward thinking. It wasn’t until the turn of the century that opposition began to be raised, questioning the wisdom of demolishing Stockholm’s irreplaceable historic core. Not worth keeping according to 19th century Stockholmers. Gamla Stan was, in part, an unsanitary slum. Stockholm was one of Europe’s unhealthiest cities, and more people died every year in Stockholm than were born. A third of all infants died in their first year. Only a constant stream of immigration from the countryside to the city kept the city’s population steady. The main cause of sickness and death was polluted water due to the lack of a sewage system, organized trash collection, or checks on industrial contamination. The unhealthy conditions that prevailed over all of Stockholm were aggravated in the dense city center where access to light, air circulation, and clean water was a luxury. Not only was Gamla Stan an unhealthy area, but it was also unkempt and ramshackle. Many of Gamla Stan’s buildings were in dire need of renovation, but there was little to encourage building owners to update their buildings. Because the buildings were old-fashioned both in style and in function, mere renovation seemed a cosmetic fix to a deeper problem. A constant housing shortage ensured that landlords had a market for their apartments regardless of their appalling condition. Gamla Stan was still the center of Stockholm’s commerce, so renting out commercial spaces wasn’t problematic either. Because of its centralized location and because the Royal Palace (map 1) was located on the island, Gamla Stan had historically been the home of wealthy merchants and the nobility. But as Gamla Stan deteriorated and as Stockholm expanded beyond the island, the wealthier families began to leave the center for more savory conditions elsewhere in the city. 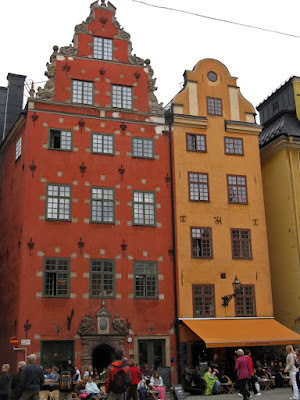 Gamla Stan became the home of the poor, and apartments were subdivided, and subdivided again. To further maximize rentable square footage, shacks were built in the courtyards until only airshafts were left between buildings. Gamla Stan was known for prostitution and for crime. Even worse in the eyes of the bourgeoisie, Gamla Stan was also (correctly) considered to be the breeding ground of “shameful” socialism. Additionally, brothels and jerry-built shacks were hardly fitting neighbors for the king. Ramshackle neighborhoods were not the grandiose and respect-inducing impression that officialdom wanted to present to visiting bureaucrats and representatives of Europe’s royal houses. 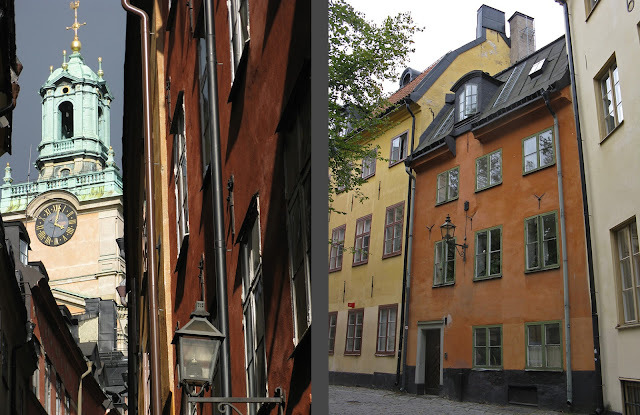 Another motivation for razing of Gamla Stan was the inadequate accommodations for the growing national ministries. At the time, it was still a given that the various ministries would be located near the Royal Palace, and the historic building stock of the Old Town seriously limited the ministries’ function and size. Similarly, the Old Town’s narrow streets were insufficient for “modern” quantities of traffic. There was no wide thoroughfare through Gamla Stan leading from Norrmalm (map 12)to the north to Södermalm (map 13) to the south. 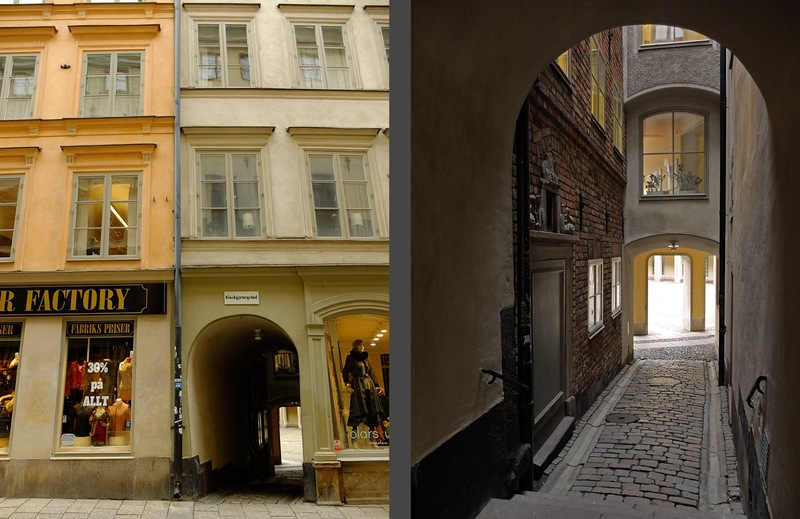 Gamla Stan's streets were considered to be too narrow and a hindrance to modern traffic. Still to this day, this very formula of unsanitary conditions, deteriorated buildings, and unsavory elements is the justification and reasoning behind urban renewal. Stockholm was certainly not the first to use this trinity of sins to justify its plans to raze the urban historic core and to replace it with a modern city; Haussmann’s Paris was much admired by Stockholm’s planers, and one city official openly wished to be remembered as Stockholm’s Haussmann. Even after Gamla Stan was eventually spared demolition, the very same formula was used to justify the demolition of thousands of historic buildings just beyond Gamla Stan’s shoreline in the 1950’s and 60’s. Today, identical arguments are used to “renew” underutilized areas of Malmö and Göteborg. Plans to raze Gamla Stan seem ridiculous and laughable today, but at the time, demolishing the area was considered to be the only sensible course of action. The fact that there were multiple plans throughout the 1800’s to raze Gamla Stan, and that they were taken seriously by the city government and praised in the press, shows that the demolition and replacement of the historic core was not a one-off idea that can be dismissed as the whim of a crazy idealist. Indeed, in the nineteenth century, the razing of Gamla Stan was not a question of if, but when. The first to put forth a concrete plan to do something about Gamla Stan was railroad magnate von Rosen together with architect Chiewitz in 1846 who proposed replacing Västerlånggatan (map 2) with a wider street and a centrally placed square. 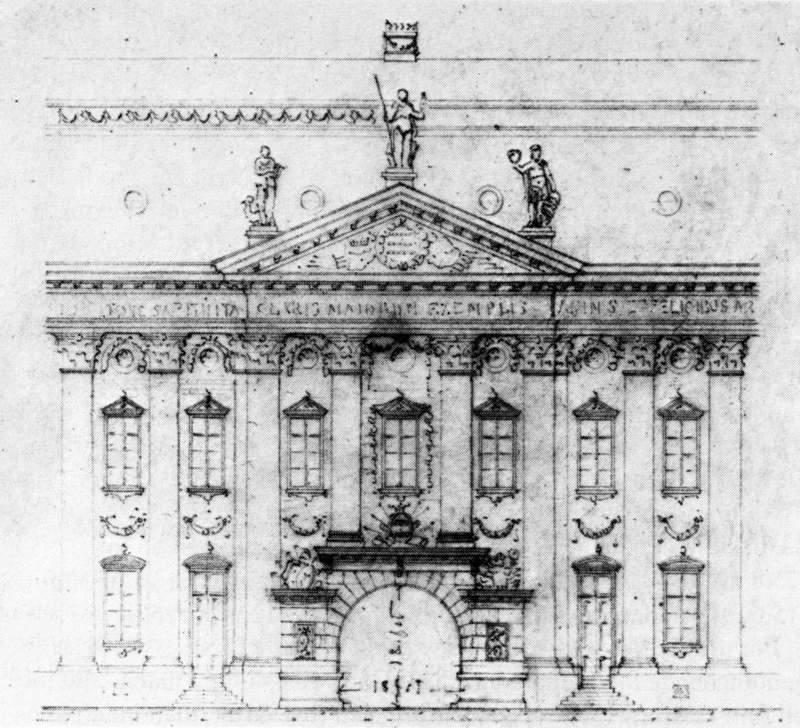 Uniform facades for the new buildings lining Västerlånggatan were also proposed, but the drawings do not survive. Around 1850, artist Mandelgren put forth a proposal to beautify Gamla Stan’s central square, Stortorget (map 3). Some of Stortorget's buildings were already "Flemish" in style but apparently the neoclassical facades were not up to snuff. 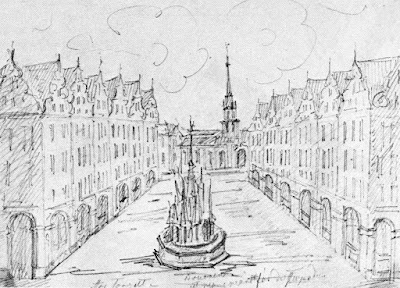 The square was to be elongated by demolishing several blocks between the square and the Gothic Tyska kyrkan, or German Church. The Gothic spire would mark the end of the axis. The buildings lining the square were to be given Flemish stepped-gable facades with an arcaded story at street level. The Neoclassical well from the 1700’s was to be replaced by a Neo-Gothic structure. Mandelgren’s proposal highlights how the relatively simple Classical stucco facades of the 1700’s had fallen out of favor to the preference for more medieval styles which were still visible in the fabric of Continental cities. This proposal is less about modernizing Gamla Stan than about "beautifying" it and creating an irresistible historical center that would be the match anything in Germany. In 1850, a group of railroad magnates, architects, and engineers founded a periodical called Tidskrift för prakisk byggnadskonst och mekanik or Periodical for Practical Building-Arts and Mechanics. This periodical was filled with articles propagandizing for better air quality in cities and the need to rebuild Stockholm. 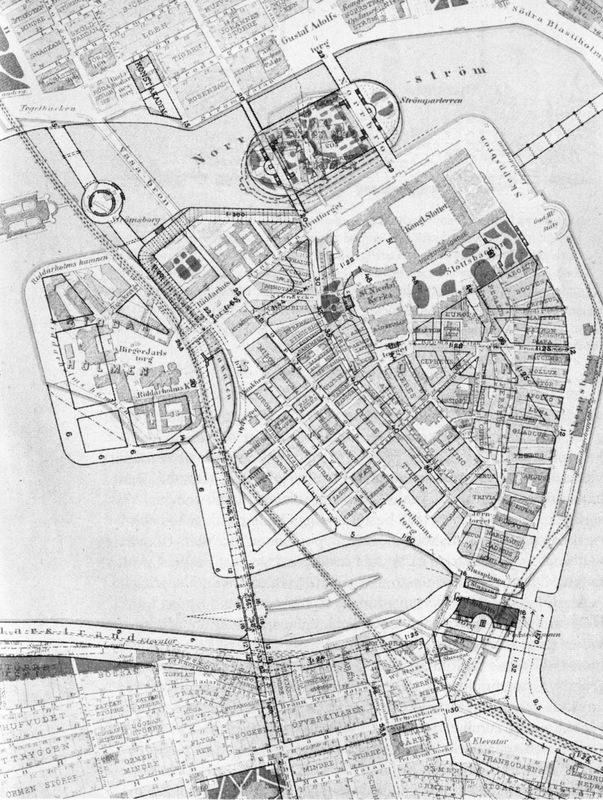 In 1853, the widely-read magazine put forth a concrete proposal for the redesign of Stockholm: First, Gamla Stan should be completely rebuilt with modern, wide streets and regular plots. Secondly, outer areas of the city already had sufficiently wide streets, but there, the relationship of building height and street width must be regulated to ensure proper air circulation. 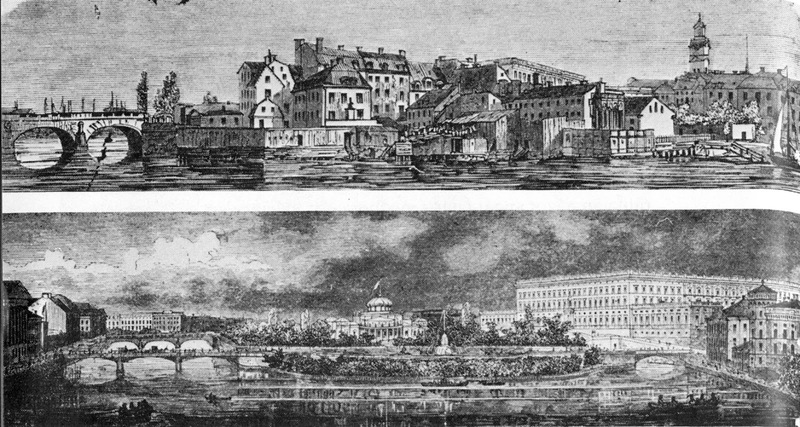 Because the beautification and modernization of the capitol was considered a national and not just a local issue, Parliament took up the question of modernizing Gamla Stan in 1857. The proposal was to tear down Gamla Stan’s inner blocks and to replace them with a wide street from the Royal Palace (map 1) to the island’s southern tip at Slussen (map 4). This new, modern street would be lined by new ministries such as the National Archive and the National Post Office. The press gushed praise at the proposal—not only would Stockholm be beautified, but it would become a physically and morally healthier city. The first comprehensive plan to demolish and rebuild nearly all of Gamla Stan in one fell swoop was put forth by engineer Schwabitz and architect Rudberg in 1859. Other issues were at the forefront at the city planning office, so the proposal was ignored. However, Rudberg refused to give up and he published, at his own expense, the slightly reworked proposal in book format in 1862. Tessin's Palace and garden, to be demolished according to Rudberg's proposal. 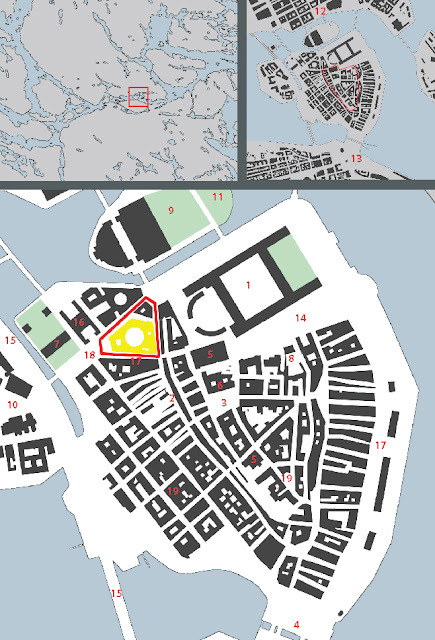 The proposal includes a new bridge connecting Gamla Stan with Norrmalm (map 12) over the island of Helgandsholmen (map 9), but a clear north-south main street is lacking. 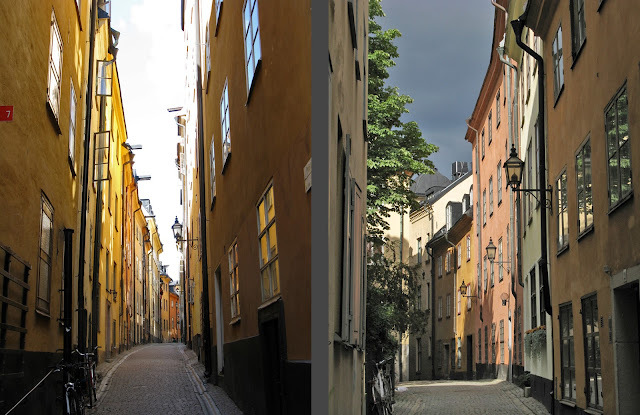 Indeed, while Rudberg’s proposed streets were wider than Gamla Stan’s alleys, they were in fact quite modest and not even as wide as the streets of Norrmalm. Rudberg's streets were, after all, modeled on two-hundred-year-old streets! The mid-block courtyards would be little more than narrow light wells. 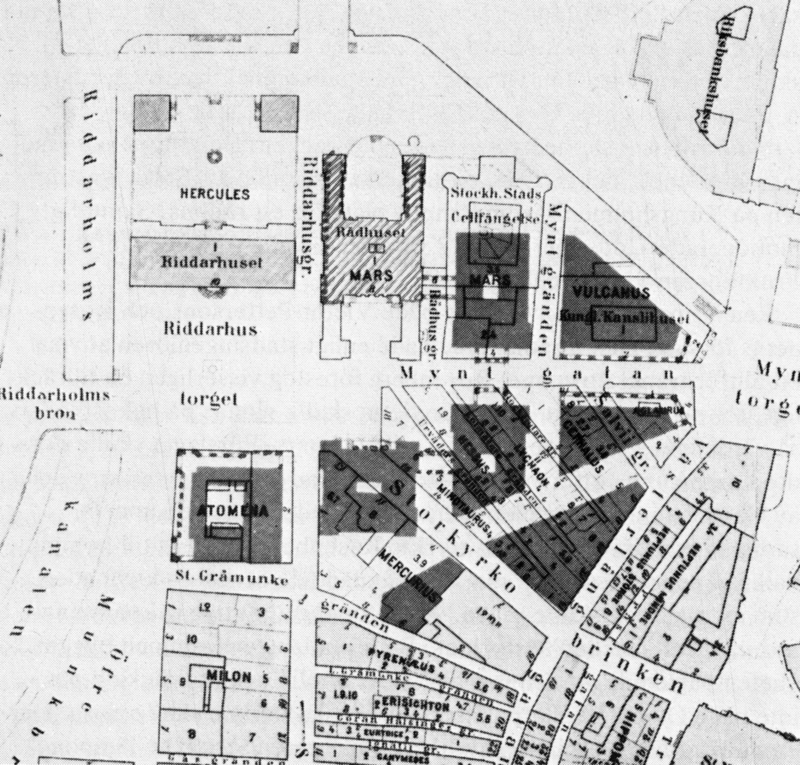 Central Stortorget (map 3) is allowed to remain, but other squares were wiped out. Instead, a new square along the Skeppsbron waterfront was proposed. Skeppsbron, Stockholm's historic skyline as seen on approach from the water, was to be demolished according to Rudberg's proposal. While proposing to destroy a key part of Sweden’s history, Rudberg simultaneously gives tribute to it as he named the blocks after Nordic gods and the streets after key figures of Sweden’s history such as King Gustav Vasa, poet Tegner, and scientist Linné. This reminds me of suburban cul-de-sac developments in the US which are often named for the forests or farms they supplant. Rudberg’s proposal encompassed not only Gamla Stan, but the two adjacent islands of Riddarholmen (map 10) and Helgandsholmen (map 9). Riddarholmen’s building stock of historic palaces was allowed to remain and to be used for governmental ministries, but the island was to be encircled by new, wide quays. A variant of this was eventually built. On Helgandsholmen, the park at Strömparterren (map 11) was to be extended across the entire island, requiring the flattening of a number of historic palaces. This idea of extending Strömparterren across all of Hegandsholmen is a good example of how Rudberg completely ignored existing topography in his proposal. Strömparterren is at least two stories below street level, but Rudberg makes no provision of how the topography of the island was to be negotiated. Rudberg similarly ignores topographic realities on Gamla Stan. His proposal is not only to flatten Gamla Stan’s buildings, but even to flatten the island’s considerable topography. This meant that the remaining historical buildings such as the churches and the Stock Market, which sit on the island’s highest ridge, would be reached by monumental staircases. 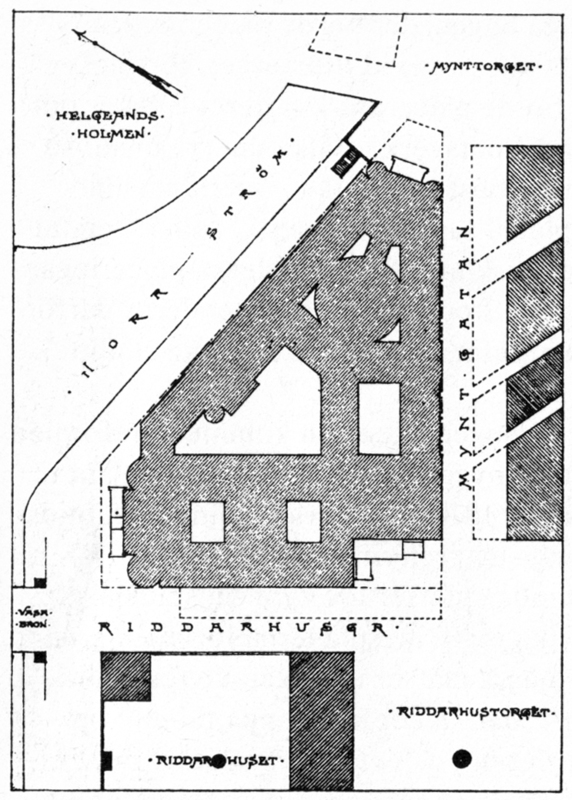 However, Rudberg does not delineate the space needed for such monumental staircases on his plan. There was no altruistic social agenda behind Rudberg’s proposal—the point was not to give the poor better housing conditions; instead, the poor were to be moved to the outskirts of town, where they would have access to land for kitchen gardens. 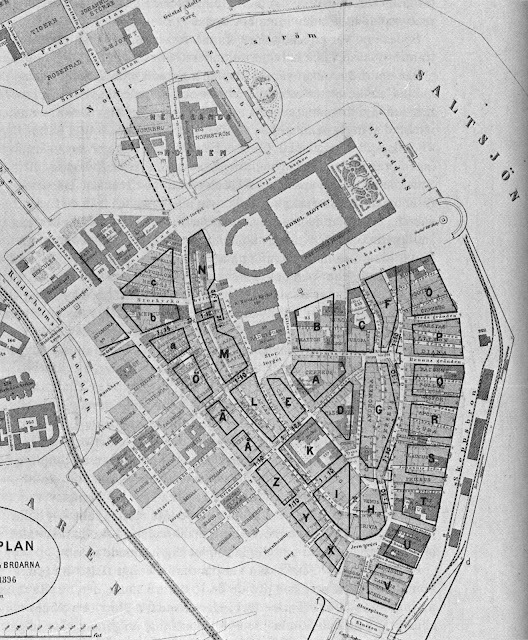 The new Gamla Stan was to be inhabited by the clean and morally sound middle class. 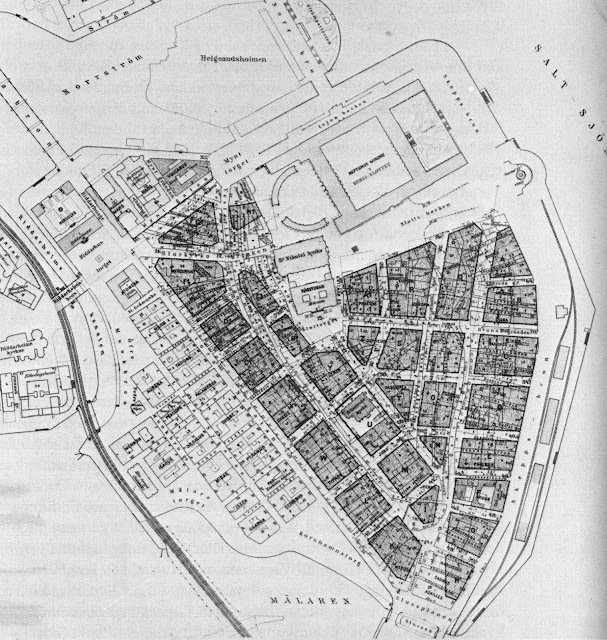 Wallström and Rudberg’s plan for greater Stockholm was severely criticized by the reviewing committee (which was not incidentally headed by Lindhagen, more about him in a later post) and thus forgotten. Tragically, Rudberg had literally given his all to his proposals—not long after his plan for Stockholm was so severely criticized, he declared bankruptcy and died of exhaustion. 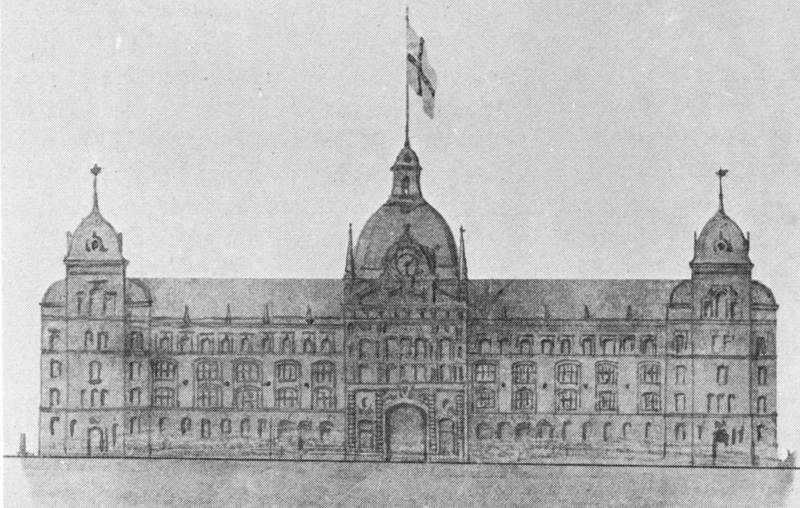 In 1874, City Engineer Brodin with architect Kumlien and Lieutenant Ryding drew up another proposal that was similar in scope to Rudberg’s with the exception of Riddarholmen and Helgandsholmen. Brodin’s proposal paid a bit more attention to existing topography, however, and the proposed new streets were more generously proportioned. The considerable costs of the project would be offset by making the blocks five stories instead of Rudberg’s four stories. The creators defend the destruction of Gamla Stan saying that “nothing of architectonic worth will be lost.” In this proposal, Tessin’s Palace (map 8) was allowed to remain, but the garden would have to be demolished to make way for a new street. Because the city planning office was busy with plans for other areas of Stockholm, Brodin’s proposal was archived without much discussion. The city’s plans for greater Stockholm left Gamla Stan in the limelight, but the central historic district was still affected in some discussions around the planning of bridges. 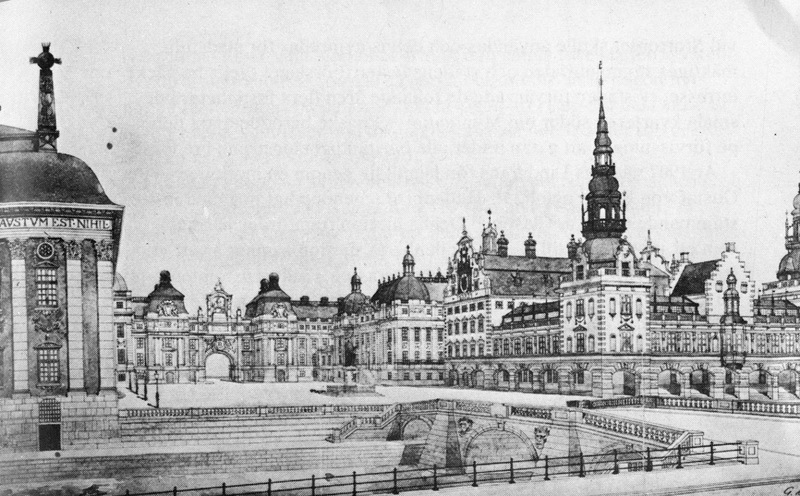 For example, one bridge from Norrmalm (map 12) to Gamla Stan was proposed that would bring a roadway through “Riddarhuset’s [map 7] unusually wide vestibule” according to architect Ekman’s 1872 proposal. Riddarhuset, thankfully without a roadway piercing through its middle. Throughout the 1880’s, record numbers of apartments were built in Norrmalm (map 12), Södermalm (map 13), Östermalm, and on Kungsholmen. The pressure on Gamla Stan began to lessen and its population began to slowly decline. In 1886 and again in 1888, Commander Champs raised the question of if the time was now ripe to take action in Gamla Stan. His proposal was similar to Brodin’s, but the city still did not find the idea to be monetarily profitable. In 1889 and again in 1890, Sandahl drew up plans to completely rebuild Gamla Stan. 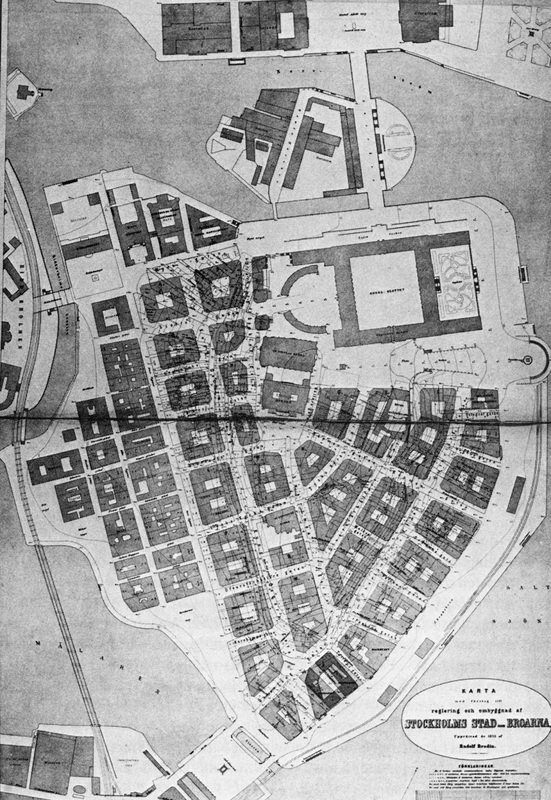 Streets and blocks were to be regularized like in Rudberg’s and Brodin’s proposals, but Sandahl introduced parks to Gamla Stan. The sloping Slottsbacken (map 14) along the Royal Palace was to be terraced and planted as would a new, open square in front of Storkyrkan Church (map 5). Where several streets meet at odd angles, Sandahl provides for generous, scenic squares. Unlike Rudberg and Brodin, Sandahl’s proposal incorporates several main north-south thoroughfares and he even predicts the later-built Centralbro Bridge (map 15). 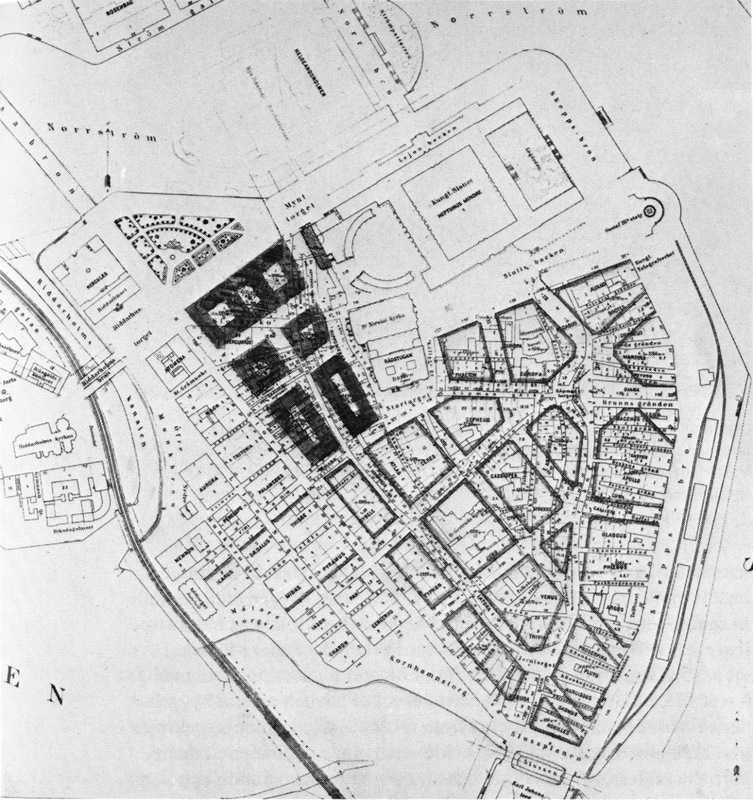 Traffic circulation was the main focus of Theorell’s 1891 proposal which included no fewer than four thoroughfares to be cut through Gamla Stan. Alrutz was probably influenced by the widely published architect Hallman (more on him later) who reacted negatively to projects such as Haussmanns Paris. He criticized gridiron planning as well as Paris’s long and “boring” boulevards and instead praised street systems that were at one with the terrain such as historic streets in Sweden’s medieval cities. While German architects such as Sitte had been articulating such ideas and praise for the old way of doing things for decades, Hallman was the first outspoken Swedish architect to turn away from modern planning. Medieval architectural styles were already in vogue, now medieval city planning was once again coming to the fore. In 1896, Söderlund presented a motion to city hall to block all planning efforts like the Knös and Ygberg proposal. He wrote that city planning had too long “thought only of traffic requirements” and that the aesthetic was so disregarded that “our newer city plans have a nearly frightful stereotypical rigidness.” Söderlund wrote that artists were needed by the side of engineers in the city planning process. 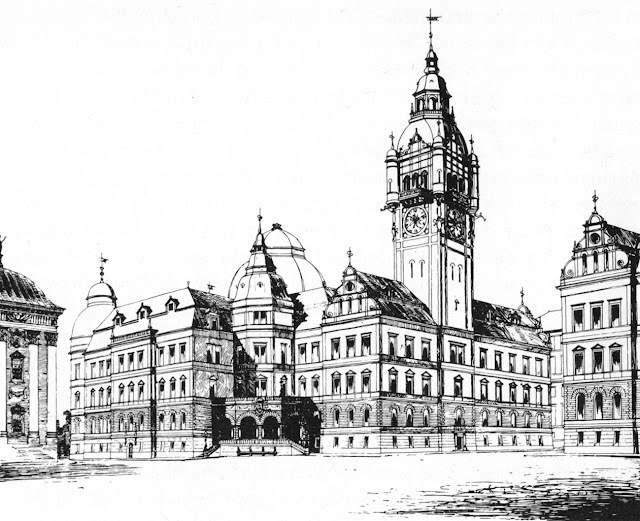 He felt that planners are responsible not only for the creation of sufficient traffic solutions but also to create a city for the future worthy of being a historic capitol. But the next year, another proposal for the demolition of Gamla Stan in favor of traffic thoroughfares was presented by railroad magnate Dalström. Dalström’s plan was very similar to Knös and Ygberg’s proposal except that the new plan paid a bit more heed to existing topography. Somewhat in keeping with the newer attitude on preservation, Dalström admitted that Gamla Stan was picturesque. None-the-less, he argued that demolition was necessary, and that the longer the city waited, the more expensive it would become. Yet another proposal in 1901 by engineer Rosenberg also feels familiar. Here, several blocks near the Royal Palace are earmarked for new city and national ministries (the darker blocks in the plan below). 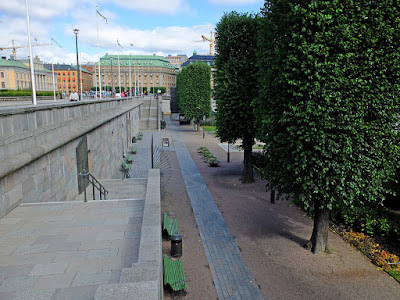 and an open square at the junction of several new, wide streets in the middle of Gamla Stan provided an axis between Skeppsbron (map 17) and the Royal Palace’s southern portico. At the same time as he proposes tearing down a large area of meaningful history, Rosenberg’s City Hall is ironically historical in style. The city considered Rosenberg’s proposal but decided that it was both too wide-ranging and too contentious. In 1901, the city funded the Society of St. Erik (the patron saint of Stockholm) whose main task was to inventory Stockholm’s historic building stock. The inventory in conjunction with grass roots campaigns eventually led to a series of historic preservation regulations on both the national and local levels. The new regulations aren’t fail proof—thousands of Stockholm’s historic buildings were demolished in the 1950’s to 1970’s—but Gamla Stan has been relatively safe from wholescale demolition threats since the beginning of the 20th century. These days, the tourist industry serves to ensure that wreaking balls stay out of Gamla Stan. In the mid 1800’s, proposals to renew the Old Town were put aside due to expense. By the late 1800’s, proposals for the comprehensive demolition Gamla Stan were contentious due to a rising interest in historical preservation. 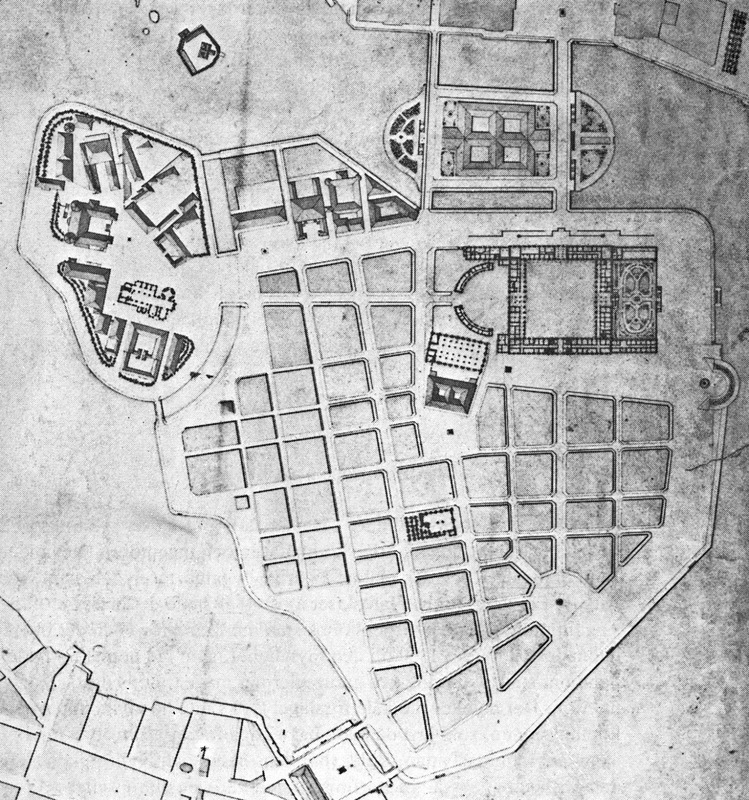 However, the need for large buildings to house the various administrative functions of the national and city governments was still acute, and the vicinity of the Royal Palace (map 1) was still the self-evident place for such functions. Newer proposals for Gamla Stan are (for the most part) limited to the insertion of modern ministry buildings within the existing historic fabric. Lindgren’s 1905 proposal looks at a slightly expanded area compared to Hallman’s plan. 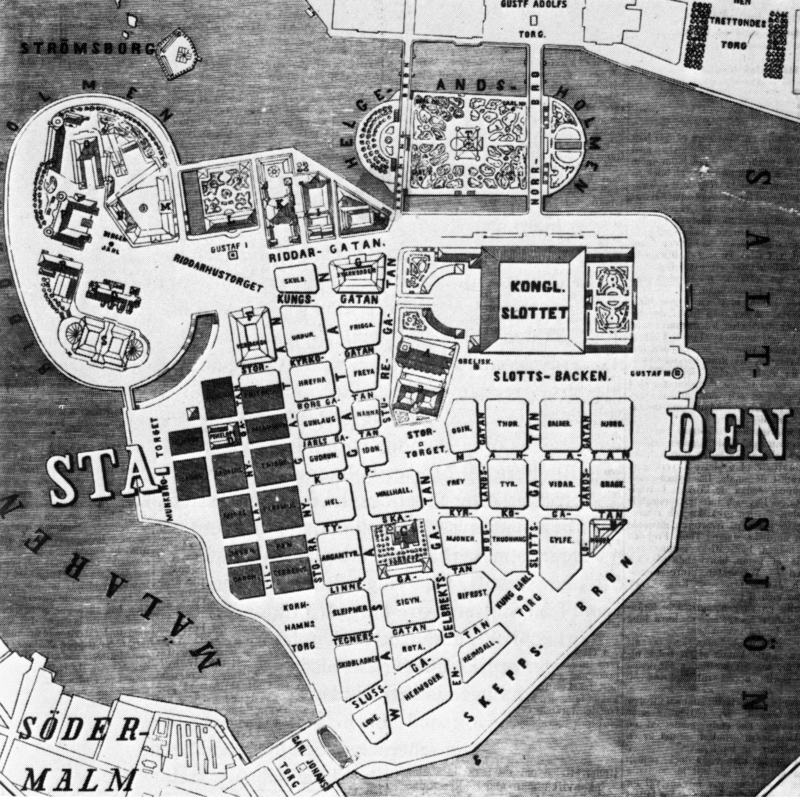 Lindgren’s plan calls for a City Hall, a City Court, a Stock Market, as well as several other ministries to take over the northwestern part of Gamla stan. Again, the architecture is a jumble of historical styles. Historical buildings were allowed to remain on the outside of the new megablock. leading now into an interior courtyard of the new building. 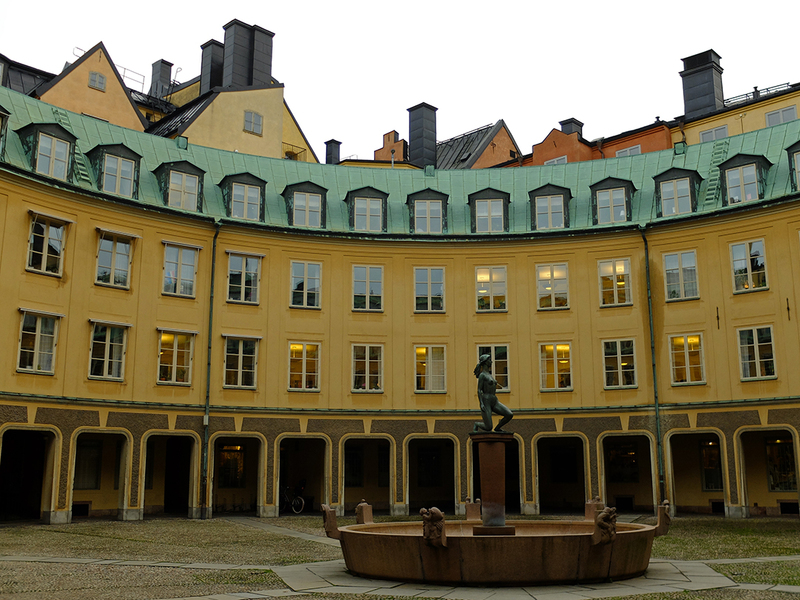 The roofs of the surrounding buildings that were allowed to remain are visible from the Finance Department's interior courtyard. While the Finance Department’s building’s plan is out of scale with its surroundings, the ministry’s height, yellow-colored stucco, and architectural detailing are in modest keeping with the historic buildings around. In fact, the seam between old and new on Storkyrkobrinken is quite inconspicuous. Left: The building on the left is the Finance Department. Right: Seam between new Finance Department on the left and a historic building on the right. The slightly rounded facade facing Riddarhustorget (map 18) not only hints at the circular interior courtyard, but it is also clearly reminiscent of Palmstedt’s concave facade at Tyska Brunnsplan (map 19), not too far away on the island. Concave Finance Department on the left, and concave Tyska Brunnsplan on the right. On the whole, I think that the Finance Department building is a very successful example of a modern building blending into its historic context. I am less enamored, however, of the long, blocky, empty arcade facing onto Myntgatan. I find the arcade to be out of place and more of a reference to historic Italian architecture than Swedish building forms. And then, of course, there's the question of whether new architecture shouldn't look, well, new. When I first started researching this topic, I thought that the Rudberg proposal was a standalone laughing-stock idea that gained little traction. I was astounded to learn that although the Rudberg proposal is the most well-known, it was only one of a whole series of plans to demolish Gamla Stan. 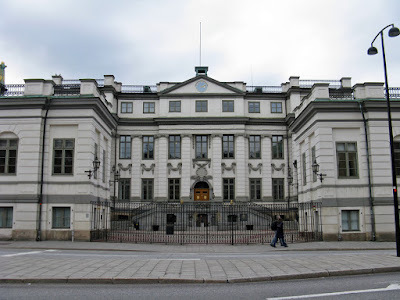 I was even more dumbfounded to learn that the plans to raze Stockholm’s historic core were received with admiration for their modernness by the public, by generation after generation of city administration, and by the press. What seems unthinkable today was clearly accepted as a first-rate idea not too long ago. The pendulum of public opinion as well as the self-evident right and wrong in city planning does swing widely. While the majority of the demolition plans were created by engineers, the wholescale demolition of Gamla Stan cannot be solely attributed to unartistic traffic planners. City planners in the city administration were clearly interested in the ideas, and the most well-known proposal of all was put forth by Rudberg, an architect. Professionals across the board were positive to the idea of tearing down the Old Town—differences of opinion were a matter of time more than a matter of profession or background. I have touched on the topic above, but I can't resist reiterating how strange it is that while the proposals above advocate tearing down the Old Town with the purpose of modernizing it, every single sketch is of historically stylistic architecture, be it Neo-Gothic or Neo-Dutch or Neo-Classical or Neo-Renaissance. The architects and planners were not at all interested in modern-feeling architecture; they were only interested in "modern" city planning with somewhat wider streets, direct thoroughfares for improved traffic circulation, and a cleaned-up middle class. 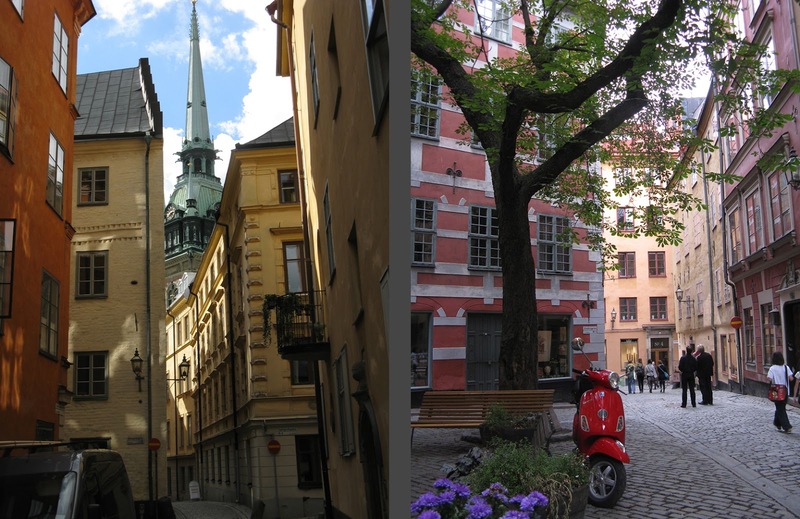 It was ok if the Old Town seemed old and cutesy, but it was not appropriate for central Stockholm to be genuinely old with its associations of crowded and unsanitary living conditions, grungy streetscapes, and worn-out buildings. Sadly, this post foreshadows an intense wave of demolition in the mid-20th century. Even though it was only about 50 years after Gamla Stan was pardoned from wholescale destruction, the lessons learned from Gamla Stan were no longer deemed to be applicable. Or at least not applicable to adjacent areas of town. It almost seems like having left Gamla Stan unscathed, planners of the mid-20th century felt justified in demolishing other historic areas. Retaining cutesy Gamla Stan was one thing since the preservation ideals could be contained to a small island, but historic preservation on a larger scale in the rest of Stockholm wasn’t deemed practical. I am sad about the loss of other parts of historic Stockholm, but thankful that at least Gamla Stan was allowed to survive! All of the photos are mine. Images marked with * come from Gösta Selling’s book.